Today, Guillemont, between the towns of Albert and Peronne, is a small quiet village located in the Somme Region. But in 1916 things were not so quiet because Guillemont was a strategic objective of the allies in the Battle of the Somme. From July 1916 many assaults took place to capture Guillemont from the German forces who were in occupation. If you would like to read about the background and events surrounding the capture of Guillemont, a good publication to read is "Guillemont Somme" by Michael Stedman, published as part of the Battleground Europe Series. 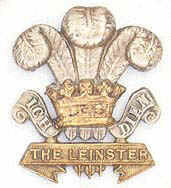 The involvement of the 2nd Battalion Prince of Wales Leinster Regiment at Guillemont was as part of the 24 Division's 73rd brigade. Orders reached the 2nd Battalion at their headquarters at the "Briqueterie" in the late evening of the 17 August 1916 and they had moved into position not long after midnight on the morning of the 18 August. The battle did not commence until 3pm when a barrage was fired at the enemy's positions. The first offensive of the 73rd Brigade involved the 7th Northampton Regiment and the 13th Middlesex Regiment with orders to capture the German front lines. The 2nd Leinsters were to be part of the second offensive to capture Guillemont, however the defence of the village by the German front line repulsed the initial attack and the British Forces fell back. Fearing a counter attack by the German forces, Lt. Col Orpen-Palmer ordered the Leinsters forward to hold the line in the forward trenches. Whilst moving forward Orpen-Palmer was severely wounded and command of the battalion was assumed by Captain Poole. The 2nd Leinsters suffering immense casualties held the line against the 73rd Hanoverian Fusiliers, who were only 150 yards (212 meters) away until nearly midnight on the 18th when it was replaced by the 1st North Staffordshire Regiment. When the battalion moved back out of the front line Major Murphy took over as Officer Commanding. The village of Guillemont had gone, marked only by the lighter colour of the craters created by the pulverised white stone houses. A small wood known as Arrow Head Copse had ceased to exist and all was complete desolation.